La Cruz de Ferro, the Iron Cross has a rich history in Camino lore. Pilgrims bring a rock or some other totem of meaning to add to the base of the Cross. When one gives the rock, the pilgrim gives up something.... Something that blocks one's path to one's destiny. I gave two rocks; one that I carried for a couple hundred miles and one that I picked up from the morning stream (dominating our path on this rainy day). My first rock forgave my parents for the poor start in life that they gave me. They've been gone for some time, so this forgiveness has been a long time coming. In this forgiveness I have released myself to move on. A huge relief today on a pile of rocks supporting an ancient symbol. My second rock directs me to better choose how I serve my community and friends. More 'just say no', more service aligned with my changing interests. A really big day for me and a great start for the final third of my pilgrimage, the spiritual segment. Here's a funky little town with the population of one. 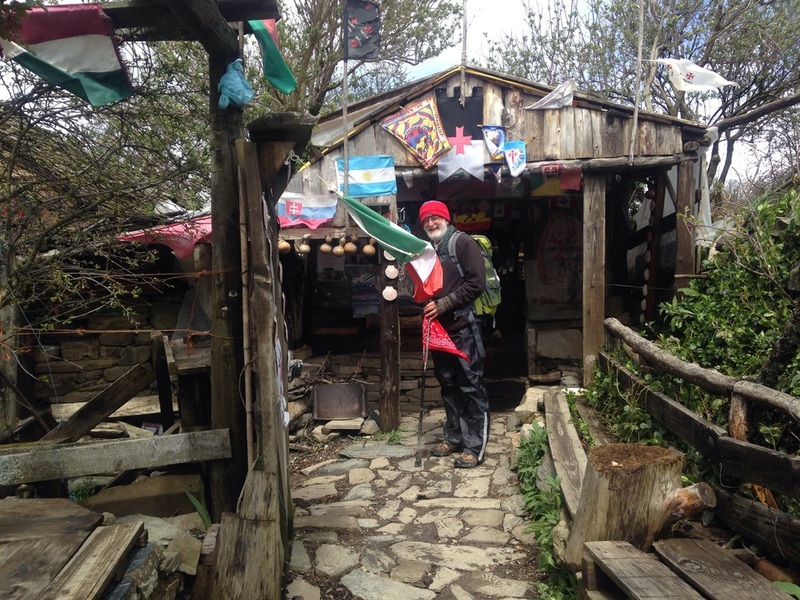 He runs a very rustic Albergue with 35 mattresses cast about the floor. The bathroom is outside, just take a walk. We can all be ourselves and find a place to grow and mature. I give this one man town a star and a five minute visit. Here's our rainy day. Before this moment the fog and clouds sat low, so low I had no view and thoughts of missing the Iron Cross. But this moment lifted the clouds and we hustled to the Cross. Great views walking 'down the hill'. Just beyond the Cross we crossed over the highest peak on our journey, at around 4,600 feet. All the guidebooks write about the toughness of this portion of the walk. Definitely not tough by our Sierra standards. We arrived in Acebo a bit worn from the rain and lack of places to rest and snack along our 10 mile walk. Our hotel is very nice and I liked the wood oven downstairs. It wasn't fired up tonight. We're expecting more rain for the next 4-5 days. My clothes will be dry in the morning, my tummy will be full and we've decided on a 9 mile walk to a small city with an old Templar castle. Stay tuned.